Canada’s women’s sevens Olympic team will be playing for a bronze medal in Rio after dropping their rugby sevens semi-final match to Australia 17-5. 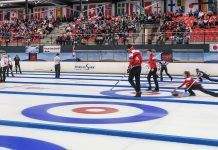 Australia, the top-ranked team in the world, advanced to the gold medal match where they will play second-ranked New Zealand, while Canada will face Great Britain for bronze. Canada and Great Britain will be familiar with each other as both teams met on day two action in pool play, with Great Britain taking top spot in Pool C with a 22-0 win. The medals will be the first ever handed out for Olympic rugby sevens. Australia showed why they are the top seed in Rio with a clinical 17-5 win over Canada. 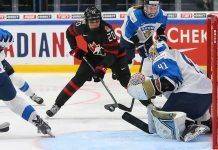 It was always going to take a great performance from Canada to compete with the world’s best, but the Canadians made some uncharacteristic mistakes and Australia was able to capitalize on that. Handling errors and penalties hurt Canada has Australia controlled much of the possession throughout the match. 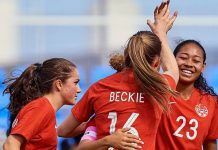 Australia opened the scoring three minutes in to go up 7-0 but Canada was unable to keep it a one-score match at halftime as Australia scored after the first half hooter sounded to take a 12-0 lead into the break. After Australia extended the lead to 17-0, Charity Williams picked up her first try of the Olympics as she touched down with 30 seconds left to cut the lead to 17-5.